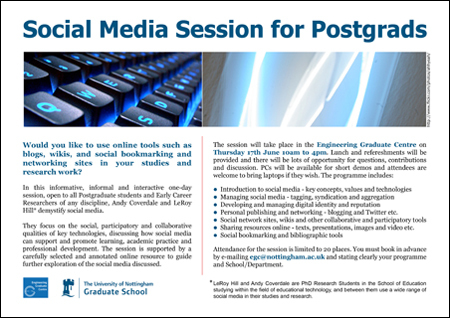 Following on from our successful lunchtime sessions at the Jubilee Graduate Centre earlier this year, me and LeRoy are repeating our Graduate training in social media at the Engineering Graduate Centre (EGC) on Thursday 17 June. This time we are conducting a single, full-day session (10 till 4), which will incorporate all the presentational elements from the Jubilee sessions whilst allowing, we hope, greater opportunities for interaction and discussion from the attendees (as suggested in our Jubilee feedback). As this will be the first time we have delivered a session on the main campus, it is being co-funded by all four main campus Graduate Centres. Whilst the session is open to all Postgraduate students and Early Career Researchers across the University, the venue may attract a strong representative from the Engineering faculty, and EGC manager Rebecca Dowsett has suggested incorporating more ‘hands-on’ approaches might be appreciated. Whilst we will be demonstrating a number of key social media during the sessions, time limitations restrict any formal workshop component, but we hope there will be opportunities to ‘break-out’ from the session room and use the Centre PCs for additional demos during breaks and lunch. Mathematician, scientist and philosopher Martin Gardner, died earlier this week. For 25 years, he inspired many new thinkers with Mathematical Games, his monthly column in the Scientific American. I knew him primarily as the author of The Annotated Alice, the definitive work on Lewis Carroll’s Alice books. It perfectly demonstrates his multiplicity as a critical rationalist and sceptic with a love of the fantastical and irrational. Academic obituaries often focus on contribution to knowledge and tangible artefacts. What’s interesting viewing Mathemagician, David Suzuki’s programme on Gardner from 1996 (The Nature of Things, CBC), is how much his unique interdisciplinarity was enthused by the network of personal connections that both inspired, and were inspired by, Gardner’s infectious sense of fun. As fitting a tribute as any. This seems to me to offer a much more astute perspective with which we might try to understand engagement with the social web than many accounts that focus on generational differences determined by technological competencies or psychological wiring. Though I would argue that our identity is never fully ‘established’ as such (as that would almost suggest we stop learning), recognising the learning trajectory as a process of identity formation that is situated and socially and culturally negotiated resonates with many of the conceptual ideas I am exploring. I greatly value the many opportunities my Higher Education has given me to study alongside international students; for their friendship, perspectives and cultural diversity, and this is my first chance to engage in academic work abroad since starting my PhD. I sometimes feel academic discourses in e-learning and learning technologies tend towards a North American bias, marginalising valuable European (particularly non-UK) research in a global field. So I’m hoping this event will provide an opportunity meet up with fellow PhD students from across the continent and establish sustainable links for the future. It looks like a packed programme of seminars and workshops, with plenty of opportunities for networking, and I’m hoping to stay on for a couple of days for extra sightseeing. I get the feeling a lot of people who were actively involved in early online communities and blogging miss the relative simplicity that the smaller number of participants provided. As I commented recently on Virginia Yonker’s blog, the key is in how these were small enough to be easily identifiable and manageable. Being a relatively late adopter, I can appreciate how the affordances of current social media has enabled mass use, yet with this comes a radically different dynamic of social engagement, which is not necessarily more distributed but infinitely more populated and complex. Many see the answer in developing Personal Learning Environments / Networks (PLE/N) and employing technology-enabled methods such as subscription and aggregation to keep up with it all. Yet does the adoption of a learner-centric network logic require us to develop aggressive, neo-liberal marketing strategies with an emphasis on self-promotion and immediacy to get noticed? Is this at the expense of the richer communication and identity formation associated with traditional modes of participation and interaction? There remains a natural human inclination to want to engage in, and become identified as a member of, communities, but how can this be cultivated in a more network-based culture? Does this equate to a trade-off, where we embrace the advantages of an expansive engagement with wider networks and multifarious communities, or do we restrict ourselves to fewer, or even singular, localised groups? I’ve discussed various aspects of my blogging previously here. Suffice to say, i see this blog as the focal point of my web activity. Even though I’m frequently more active in using Twitter, Delicious, Mendeley and other tools, this is at the heart of my engagement with the wider academic community and the first place I direct anyone interested in my work. I use Google Sites for my wiki. It’s a wiki tool in all but name, and one I find to be more effective and reliable than others I’ve tried (such as Wetpaint). I feel I’m yet to develop the full potential of the wiki. It remains a largely static repository whilst it could integrate much more dynamic cross referencing and annotation to facilitate thesis development. Perhaps this will be realised once I reach the writing-up stage of my PhD. I have no problems sharing my work in progress – I think it’s a personal choice. As my PhD is fundamentally rooted in participatory practices and openness in academic work, I guess it helps to practice what I preach. I don’t think many people actually read the wiki, but occasionally it’s useful to reference parts of it on my blog, which is a more appropriate platform for gaining feedback. My research journal is an old-fashioned diary-style Excel file which I use to collate random thoughts and ideas, quotations and references, and notes on seminars I have attended etc. 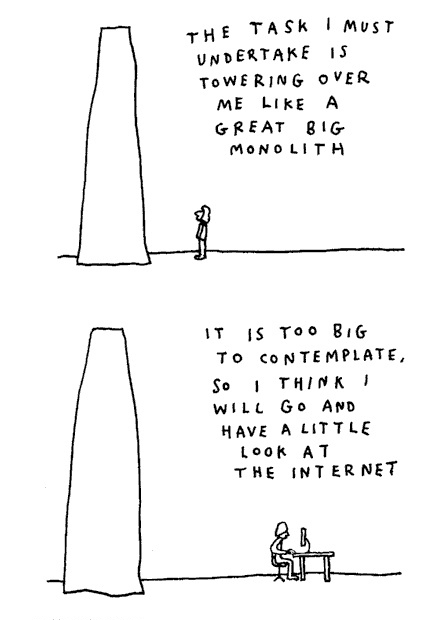 – much of it actually on the periphery of my PhD. Some content may become formalised into blog posts, wiki entries and thesis drafts. Maybe I should use a private wiki-type site for this, to enable access from any computer and facilitate better search and cross referencing. These tools are interconnected in various ways to other tools and services which I use both on and off-line, particularly my Twitter and Delicious sites. I’ve also started using Evernote again, primarily to keep tabs on comments I make on other people’s blogs and in social network sites and fora. (I’m considering this or some similar web-based ‘sticky notes’ system for my participants in my main study). Some call this combination of tools a Personal Learning Environment/Network (PLE/N) – ambiguous and contested terms I’m happy to let others use. Key for me is identifying how and why we adopt and configure these tools, and how they transform and disrupt our academic practices. It’s always worth reflecting on your own use of technologies when investigating others.